Chicago Kid Records Through its association with Richard Vertel and Life Rhythms LLC, powers into summer 2000, with the release of the first Artist ever recorded for our own label. 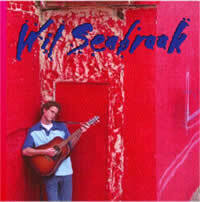 Wil Seabrook, from Durham, North Carolina is a singer songwriter with massive potential to touch a wide audience. Since his parents were teachers, Wil grew up all over the world...from Germany to China....and has a voice with depth and soul rare for artists of his young age in the alternative pop/rock genre. The jazz and R&B influence will be obvious as his music sails out across the radio airwaves. John Ryan has just put the finishing touches on his debut, with the Big Beats of Silverlake's Goldo, keyboards by Paul Trudeau (Meredith Brooks/Blinker the Star) and textures by English mixmeister Stoker, (Sting/Dr.Dre/General Public) to a dazzling result.